If you have a nice outdoor patio umbrella, you should protect it from harsh weather conditions. Our waterproof patio umbrella cover has excellent quality and reliability to meet most of your requirements. Premium quality Oxford material with double stitched bound edges, wear-resistant and durable. Waterproof PU coating provides full UV protection against the sun for longer life. Velcro can be adjusted to tighten the umbrella. Sailboat shape design can effectively prevent wind. The bottom drawstring strengthens the wind resistance. Full weather protection. 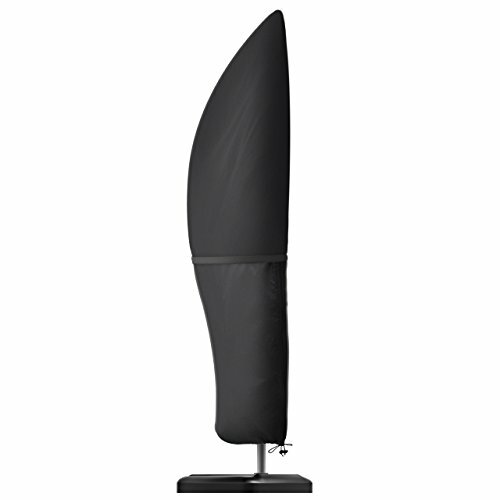 Protect the patio umbrella from bird droppings, tree sap and pollution. Equipped with a zippered bag for easy storage. Please check the size of your outdoor patio umbrella before purchase. The umbrella cover size may be 1-5mm inaccuracy due to hand measure. Only one umbrella cover included, umbrella and rod not include. 【Suitable Size】A comprehensive range of waterproof Patio Offset Umbrella Cover, Premium banana cantilever parasol outdoor umbrella cover. It fits 9ft to 11ft patio umbrellas. The extra magic tape in the middle can be properly adjusted to tighten the outdoor umbrella. 【Resistant and Durable】Make of heavy-duty and high quality 210D non-fading Oxford material, its Inner coating and double stitched bound edges can prevent cracking for long-lasting use. Test report passed; It also can effectively resist tearing and mold accumulation. 【Waterproof and Wind-resistant】Strong waterproof Oxford Fabric, PU coated, breathable and tough enough. This patio umbrella cover can provides full weather protection. It's designed to be durable and firm, so the umbrella would not fall down in the wind. Against the UV, rain, dust, bird droppings. Bottom drawstring closure to ensure the wind doesn't lift it off. 【Easy to Use and Storage】Rust-proof side zipper and storage bag make it easy for your storage and use without taking up space. You can rinse it with water hose or wipe with a damp cloth, then dry it in the sun before the next use. 【Warranty】Please be advised that VicTsing has 12 Months Warranty and 60 Days Money Back Guarantee.